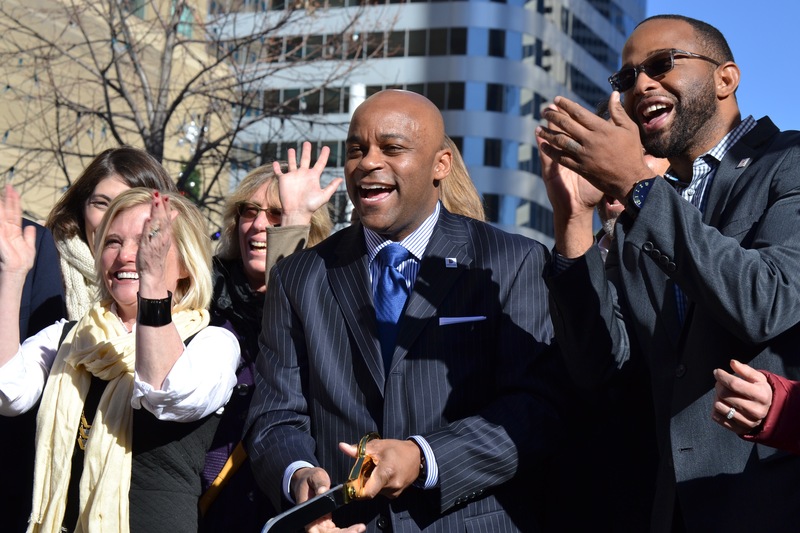 Mayor Michael Hancock officially opened Denver’s first parking-protected bike lanes Thursday with some revelry on the corner of 16th and Arapahoe. The two new bike lanes — one on Arapahoe Street and one on Lawrence Street — run a little over one mile each, from Auraria Campus to 24th Street. They include traffic signals that finally give people on bikes a safe way to cross Speer Boulevard, Park Avenue, and Broadway. 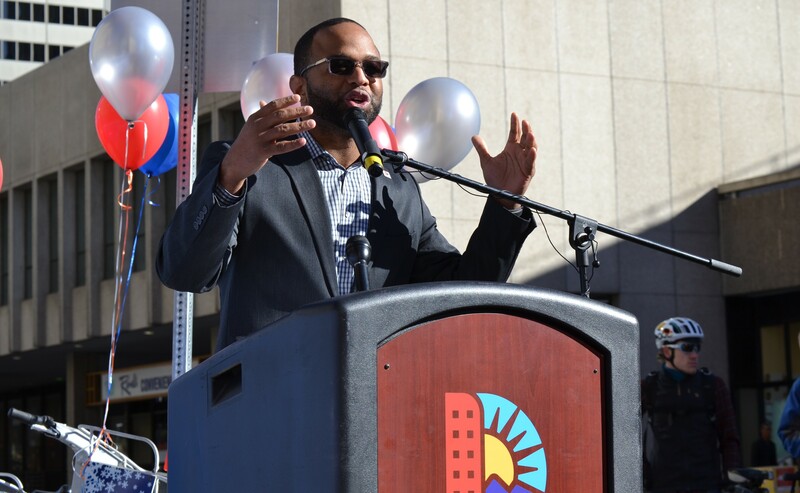 Hancock thanked the Downtown Denver Partnership, which sparked the project a year ago by launching a crowdfunding initiative. After that, bike planners from the Department of Public Works and advocacy groups BikeDenver and the Mayor’s Bicycle Advisory Committee made the lanes happen. Right now, 6.5 percent of downtown workers commute by bike, according to DDP President and CEO Tami Door. “I can absolutely promise you that as these facilities continue to expand, that number will rise exponentially,” she said. Hancock committed to building three more protected bike lanes next year, and City Councilman Albus Brooks went out of his way to tell the crowd of about 50 people that the infrastructure is not a one-off thing. Make no mistake: The city’s protected bike lane network has a long way to go, but these additions are a milestone and a significant upgrade to Denver’s streets.